Those initial three frantic Latin rhythm meets jazz and seriously searing guitar albums seem a long time away now as the emphasis is now vey much on ambient jazz/funk/soul fusion. Keyboards and percussion are the dominant features, with Carlos Santana's trademark guitar only making occasional appearances. 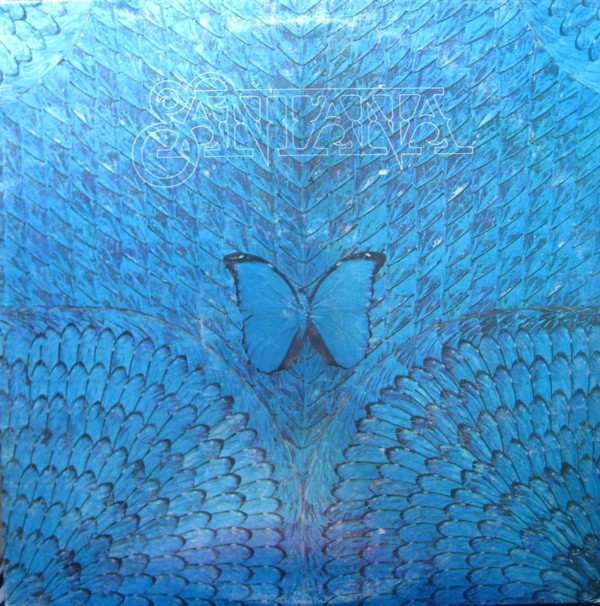 Its bright, tropical turquoise cover featuring a butterfly somehow suits the vibe of the album. The album is actually quite upbeat at times, far more than 1972's "Caravanserai" and 1973's experimental, often intense "Welcome". It is still full of extremely influential material, despite its supposedly laid-back reputation. "Spring Manifestations" is an ambient, tropical-sounding short sound effects into before a sumptuous bass line leads into the intoxicating, laid-back groove of "Canto De Los Flores". Bassy percussion, flutes and gentle keyboards are the order f the day on this, not a guitar solo to be found. Vocals arrive for the tuneful, catchy jazz/soul of "Life Is Anew". Once again, a funky keyboard dominates, as opposed to a guitar. It has a killer organ/percussion interplay in the middle, however. Then Carlos's guitar finally gets here, impressively, of course. A rhythmic percussion/drum sound drives the funk rock of "Give and Take", together with shared soul groove vocals. This almost sounds like a blaxploitation slice of urban funk. The drum/guitar play-off half way through is powerful and entrancing, as is the saxophone. This is a solid, muscular kick-posterior cut, it has to be said, stronger than anything on an album like "Caravanserai". 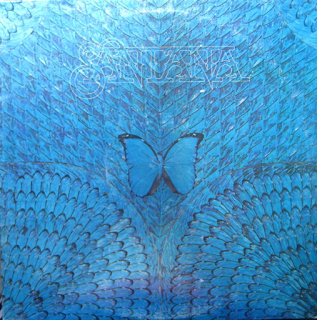 "One With The Sun" is a deliciously laid-back easy Santana groove. It has hippy echoes in both its sentiments and sound. Some excellent guitar augments the track near the end. The instrumental "Aspirations" fades in with some typically Santana frantic-pace percussion together with some cool organ and futuristic-sounding jazzy saxophone (the like of which David Bowie used a lot on "Low" and Heroes" in 1977 and 1978). 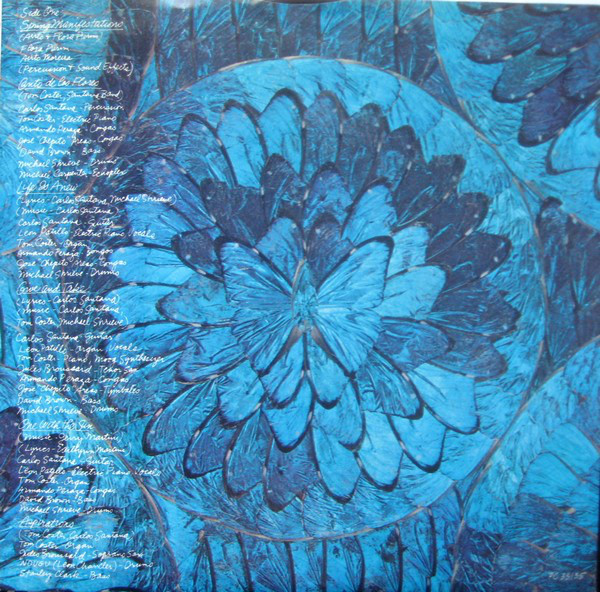 It is one of the albums most experimental, innovative cuts. Santana's guitar gracefully introduces "Practice What You Preach", which is a gently soulful vocal number. Vocals continue on the addictive funky rhythm of "Mirage". It is the album's instantly catchy and melodically memorable track. The guitar cuts into the rhythm and the drum beat is warmly insistent throughout. That is that for vocals now, and we get four instrumentals to finish the album. "Here And Now" is a psychedelic-sounding guitar and drum groove with some seriously pounding drums which effortlessly segue into the frantic percussion of "Flor De Canela". This is very much a typical Santana track and anyone listening to it would immediately recognise it as such. This blends into the extended "Promise Of A Fisherman", continuing the same percussion rhythm. Santana's guitar is given far more breathing space on here, however and he lets it float around, along with the organ. The title track ends the album, as it had begun, with jungle noises and African-sounding vocals over some random percussion sounds. In conclusion, this is a more vibrant album than it has often been given credit for. A bit of an underrated treasure.